Desire for a feeling of success, which actually strengthens self-esteem (unconditional self - love) - is a universal need. When people show the pathways for success and when individuals facilitate success through material or motivational inputs, they are highly valued. He said: success is a result of preparation, hard work and learning from failure. In pharma marketing, preparation is everything! The cornerstones of pharma marketing or healthcare marketing to prescribers (the opinion builders) are: in-clinic activity, in-stall or booth activity, in-pharmacy activity, taxi tours and small group meetings. During in-clinic activities, the field personnel get just about 2 to 5 minutes (rarely beyond that) to represent their pitch or negotiate for a better output of prescriptions and support for their brands. It is elevator pitch in action! For this set of planned calls, each individual has to organize the elements required to create the impact well in advance (samples, visual aids, literatures, small give-aways, talking points etc). The use of these need to be visualised and choreographed in the mind before delivery. Talking points have to be revised, so that the right set of talking points can be angled at the right time to the right doctor. In-stall activities are a prime opportunity to deliver give-aways with good talking points. Normally, this is the time where the prescribers do not have any patients in mind, they are more free to talk to field personnel, and this advantage can crystallize into solid productive relationships. In--pharmacy activity refers to the set of activities for OTX (over-the-counter plus prescription) products, done at the pharmacy level. It includes setting up promotional materials that stimulate POP (point-of-purchase) behavior, as such the thrust of marketing is stimulating consumption, enhancing market penetration, and strengthening word-of-mouth (among all stakeholders) this ensures better sales results. Taxi tours: are especially important in India, for rural marketing. Even to this day, stocking products and going on work tours (in taxis) to pharmacies and doctors in semi-rural and rural areas gives a significant jump in sales. This enhances market penetration and repeat purchases (also creating new buying or prescribing behaviours). Small group meetings: is an ideal setting for messaging, relationship building and give-aways. This format for marketing includes various departmental meetings held at hospitals (eg., OBG department meeting etc), in which pharmaceutical marketers can get their time to charm doctors and win their hearts. People do business with people!! This is the difficult concept: everyone claims to work hard!! So how to judge? As such, it is total involvement that counts, it makes things happen. There are qualitative and quantitative parameters of measurement for every job, which helps generate total involvement. For eg., Medical Representatives are measured by no. of doctor visits, pharmacy visits, personal order booking at pharmacies or dispensing doctors, primary order booking at wholesellers etc. The South Korean chaebols believe you get what you measure, and if any job cannot be measured it is a dangerous job! Indra Nooyi states that creating the outputs is very important (this indicates, outputs are measurable and 'felt' or perceivable). All this goes to say, that work has to be measured, should be measurable, and when there is focus on measurements, reports, feedbacks, rewards, subtle negative reinforcers, and remarks/discussions on various situations to generate better outputs - then involvement or hard work can be generated. This is the best part of Mr. Powell's statement for success. Failures normally occur more than successes. Failures represent situations where the set targets are not met or desired event does not occur. But each failure in fact is a learning opportunity, it is a part of the process for continuous improvement - NOT A CIRCUMSTANCE THAT SHOULD TRIGGER DEJECTION OR DEPRESSION. Successes can be turned into failure events, when measurement parameters are changed! When a longer line is drawn against a shorter line, a new benchmark is set!! When failures happen it means certain desirable situations or expectancies were not created. It is not a curse or a shame to experience failure. It only means there were certain elements missing, which did not make the desirable event happen. It could be due to inadequate personal effort, lack of material supports (documents, samples, gifts, powerpoints, data, money, etc), or improper timing. A failed event is one from which the lacunae should be identified. It creates experience and learning: and hence, a better approach will happen the next time. To learn from failure, the foundation attitude is self-esteem (unconditional self love). If an individual loves himself, there is positive emotional energy, which charges him/empowers him, to analyse, work hard and improvise. This attitude will help him defend himself and other stakeholders, it will also help him continuously produce self-joy and contribute to joy-kitty of others. 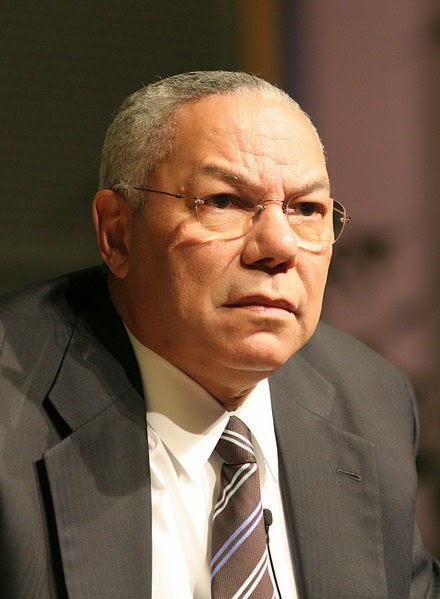 Colin Powell's sharp and pithy statement about success is a major contribution to the science of success. If one reflects on the statement - works hard to actualize the statement, only benefits will accrue for the practitioner of success science. Kindly read all below blogposts, by scrolling down, clicking on older posts, as and when required, and please recommend this blog to others.